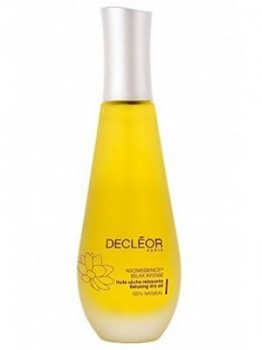 Inspired by Decleor's aromatic spa rituals, Decleor Aromessence Relax Intense is a dry oil with a fine and silky texture that immediately creates a sensation of deep relaxation. Composed of Essential Oils of Tonka Bean, Ylang Ylang, Vetiver and Vanilla extract, this oil is specially formulated to relax the body. Jojoba and Camellia Plant Oils, selected for their affinity with the skin, deliver nutrition and ensure a dry finish. This 100% pure and natural oil envelops the body in a deep soothing sensation.